Trick or treat, eat my feet, give me something good to eat, if you don’t I don’t care I’ll just throw the best Halloween extravaganza of the season! 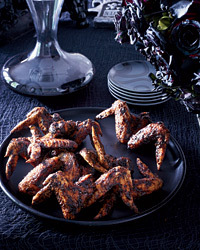 Food is one of the most important factors of any party and for a Halloween party, standard finger foods just won’t do. I will share with you some great food tips for the most ghoulish and gruesome themed, yet tasty treats for your guest. 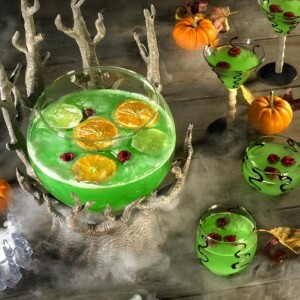 These tips are for an adult-only party though, so keep the kiddies away! 1. Red velvet cake balls with white chocolate: These red velvet cake balls will make the perfect jar of eyeballs on your dessert table. If you are artistic, use food coloring to paint a pupil and iris onto the balls; but if not M&M’s pushed into the balls before they harden will work also. 2. Pork Dumplings with Chile-Sesame Sauce:These creepy dumplings turn into quite a brain matter look-a-like when dumped into chile-sesame sauce. They are stuffed with pork, shiitake mushrooms, bok choy, scallions, and ginger. 3. Grilled Beef Ribs with Smoky-Sweet Barbecue Sauce: beef back ribs resemble human ribs so they suggest you marinate them in Coca-Cola and barbecue sauce before you grill them for the perfect look and taste. 4. Fried Chicken Wings with Black Bean Sauce: fry chicken wings and smother them in a Chinese black- bean sauce, then spread the wings a little so they appear to be bats. 5. Black Widow Goat Cheese Log:sautéed shallots and feta cheese inspire this recipe covered with black sesame seeds; then it shape into a spider and you’re all set. 6. Chocolate Mice: bake chocolate cake balls, use a semi-firm chocolate frosting for the outside, and then add mice ear, eyes, and tail decorations to complete the look! 7. Dark and Stormy Death Punch: a Grace Parisi original, this is a rum and ginger beer mix. 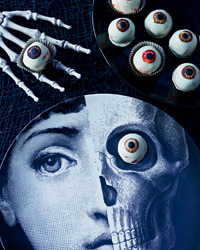 All you need are eyeball ice cubes made with lychee syrup and you have the Halloween twist of a dark and stormy. 8. Worms in Dirt (Hijiki Salad): all you need is fried tofu and Japanese seaweed (Hijiki) mixed with sesame oil dressing ; and you have a platter that resembles a grave with worms squirming in it. I hope these tips help creep out your dinner table, with the added flair of some new and tasty recipes also. For the full recipes for each dish visit the Food and Wine, just pop each title into the search box and the recipe will appear. The recipes in orangeare from David Burtka, follow the link for quick access to these recipes as well.